A fantastic laptop-friendly drum pad at a terrific price. Super-portable. Ridiculously affordable. The X-Y pad is great. Flam and Roll buttons. Not much travel in the pads. The nanoPad: very useful and great fun. The nanoPad thoroughly wowed us. 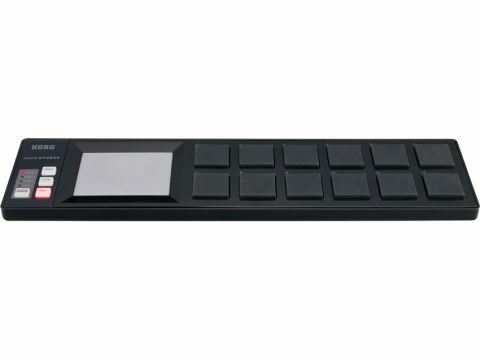 Its 12 rubber percussion pads are of a decent size and are reminiscent of the famous Akai MPC range, not to mention Korg's own padKontrol. There isn't much travel, but there's enough dynamic response to render your drum programming with plenty of expression, and the pads feel sturdy enough to stand up to your dextrous drumming digits. The backlit Flam and Roll buttons give more options for rhythmical variation, enabling the easy triggering of their respective embellishments with a single press of the pad. Engaging the Hold button means that when a pad is struck, the MIDI note is held until you hit the pad again or turn the function off. The truly excellent X-Y pad, which controls the rate of flam and roll in its default mode, is by far the best feature of the nanoPad. Once programmed with the freely downloadable Kontrol Editor software, however, things get much more interesting. Playing a beat on the pads whilst controlling various effect parameters on the X-Y pad is probably the most fun you can have with any of the nanoSeries devices. The editor also enables CC values and button behaviour to be configured for each pad, and you may stack up to eight MIDI notes per pad for triggering chords. Buying the nanoPad entitles you to a free download of Toontrack's EZdrummer Lite plug-in, with the option of upgrading to the fully-fledged EZdrummer for €79.